I have no clue how Sir Topham Hatt still has a job. The island of Sodor is the most inefficient and dangerously run railroad in history. I would rather ride in the Indiana Jones Temple of Doom mining cart than take a trip from Knapford to Tidmouth on any of those death traps. From a pretty funny post on children's TV shows at the San Francisco Chronicle. This really pisses me off about political correctness, particularly in America. "Sir Topham Hat" (as he's now stupidly called) was actually called simply "The Fat Controller" in the Thomas the Tank Engine books in England when I was little (20 years ago). 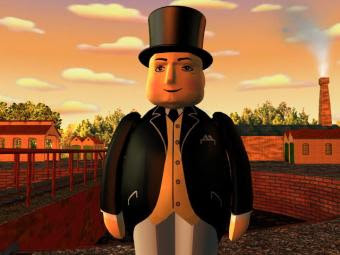 Now suddenly you can't call a fat person "fat" and he's been remonikered to "Sir Topham Hat". So sad.